OK, so what if I don't have my good camera gear? These beautiful summer mornings cannot be wasted. And even if I can't get a shot worth printing and hanging on the wall, I can still get the feel of the light around here, and scope out some places to go back to with the SLR and a couple of good lenses. And enjoy the peace and quiet, the beautiful light, and the delicious air. Left the hotel at what my old friend Jerry would call "o-dark-thirty" again - about 3:15 AM I think - and got out of the car at around 4:30 and started climbing. The trail switchbacked quite a bit. Climbing to the east, I had a chance to watch the progress of the sunrise [photo below left]. And then turning back west, a look at the mountains, with the tail lights of a few other early risers on the road in the valley bottom [photo below right]. 4:28 AM: Climbing towards the sunrise. 4:34 AM: Switchbacks turn me back up the valley, towards the mountains. Even though it is nearly pitch black and I am using a head lamp, the camera can see subtle differences in the light that my eyes cannot - if I give it a chance by using long exposure times - these are shot with the shutter open for 15 seconds. 5:36 AM: Mountains painted red by the warm morning light. After that, taking my time to complete a lap around the lake, enjoying the air, the light, and the solitude. 5:45 AM: Old stump on the lake shore. 6:25 AM: Alpine Fireweed, Epilobium latifolium. 6:10 AM: Light spreads over the lake. 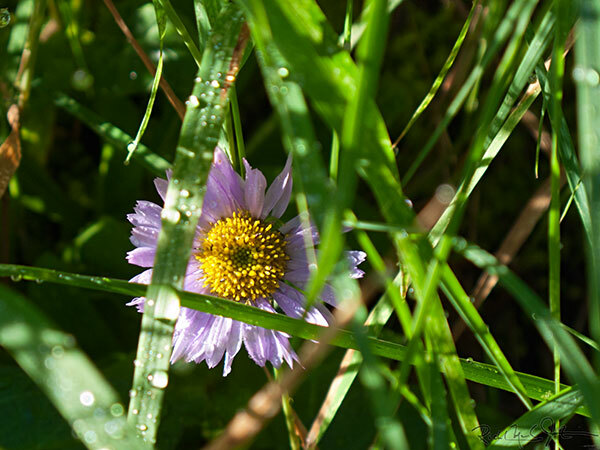 6:35 AM: A Leafy-Bracted Aster, Symphyotrichum foliaceum, hides among the grass. Then back down the hill, and into town for a bit of breakfast! 7:15 AM: Back down the hill. Link. Published on August 20, 2011 by Mark Johnston.